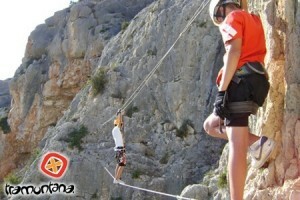 The areas surrounding the city of Alicante, also provide the ideal setting for Liking and adventure Sports. 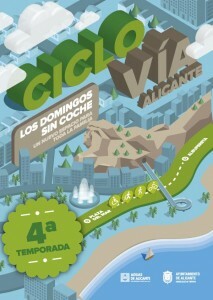 Ciclovia Alicante is roads in the city put at the service of the public to practice sports and recreational activities. Some of its goals are to: offer a free space to use for leisure pursuits such as physical activity and recreation; reduce environment pollution and noise levels; recover streets for people to get together; encourage people to practice healthy living habits; contribute to the fight against chronic diseases through the promotion of physical activity; and generate values of public coexistence, including democratic values such as tolerance, respect and peace. Tramuntana Adventure takes all kinds of outdoor activities: hiking, canyoning, via ferrata, climbing, caving, multi courses … We adapt the activities to customer needs either for a bachelor, a birthday, a group of friends or a company , and adjust both time, and number of persons or place of realization. All our activities include liability insurance, accident, specific material and specialized instructors. Singles Vacations is the project of two friends travel enthusiasts and adventure, looking to be the benchmark of leisure for those without a partner, single, separated, widowed or just want to travel alone. They travel long distances and stay-one day to dive down a ravine or simply sharing a meal with new people. Travel together to help people with the same interests and that unit y is strength. In Amalur is specialists in providing a form of creative, healthy and entertainment for the whole family. Direct contact with nature and animals are the basis for creating an environment in which everyone can enjoy experiencing new sensations. In Turiguías want to join us to discover the history, curiosities; legends … Enjoy authentic and different neighbourhoods. Our favourite lines are: “I did not know that.” and “I never imagined that this was in Alicante”. We offer guided tours, literary tours and sightseeing trips. No matter if you come alone or in groups. They are usually pretty cheap deals you can engage a large number of people and where attractive routes from the different corners of Alicante are proposed: from walks through the main Alicante a saw, among other routes.